The Morgan Library & Museum presents a special exhibition of an extremely rare Renaissance illuminated manuscript, the Prayer Book of Queen Claude de France, created around the time of her coronation in 1517. It is the most important single illuminated manuscript acquired by the Morgan in the last twenty-five years and is on view in the East Room of the historic McKim building. The tiny, jewel-like book, measuring just 2 3/4 by 2 inches, is richly illustrated with 132 scenes from the lives of Christ, the Virgin Mary, the apostles, and numerous saints. The work was created by an artist known as the Master of Claude de France and can be characterized as the pinnacle of delicacy in Renaissance illumination. The artist, named after this prayer book and a companion manuscript, was active in Tours during the first quarter of the sixteenth century. Barely a dozen of his works survive. The prayer book was given to the Morgan by Mrs. Alexandre P. Rosenberg, a longtime, generous supporter of the Museum. The gift is in memory of her husband Alexandre Paul Rosenberg, who died in 1987. Mr. Rosenberg was founding president in 1962 of the Art Dealers Association of America and was for many years a prominent art dealer in New York. The manuscript includes a bookplate designed by Pablo Picasso, an artist whose works Mr. Rosenberg exhibited in his gallery. Mr. Rosenberg collected early printed books and illuminated manuscripts; the Prayer Book of Queen Claude is considered the crown jewel of his collection. The book's miniature scenes are painted in a range of soft purples, mauves, and roses in tiny, sometimes almost invisible brushstrokes. Especially delicate is the artist's handling of atmospheric perspective, which he used to both lighten and multiply the soft colors in the landscapes and cities that fill many backgrounds in the book. 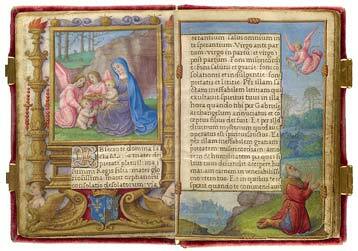 The exhibition of the prayer book includes a second, related manuscript, the Prayer Book of Anne de Bretagne. Anne was Claude's mother and queen of France as the wife first of King Charles VIII and then King Louis XII. This manuscript, which was commissioned around 1495 by Anne for her son, was illuminated by Jean Poyer, a leading Tours illuminator in whose workshop the Claude Master is now thought to have trained. Side by side the two juxtapose a mother's book with her daughter's and the work of one illuminator with that of his protégé. The exhibition includes a panel with enlargements of many of the illuminations, allowing visitors to see more closely the detail and delicacy of the Claude Master's creations. In addition visitors can view the complete manuscript on screens in the Morgan's computer alcove on the main floor of the museum. In 1514, at age fourteen, Princess Claude married François d'Angoulême, who became King François I of France the next year. Claude and François produced seven children in their ten years of marriage, including their second son, King Henry II of France. Queen Claude died in 1524 at age twenty-four. This exhibition is made possible through the generosity of Gifford Combs. Christie's is the corporate sponsor. Virgin and Child with St. John the Baptist, with the coat of arms of Queen Claude de France in the lower border and Annunciation to Joachim, illuminated by the Master of Claude de France, Prayer Book of Queen Claude de France; France, Tours, ca. 1517, MS M.1166 (fols. 15v–16), Gift of Mrs. Alexandre P. Rosenberg in memory of her husband Alexandre Paul Rosenberg, 2008. Photography by Schecter Lee.